Assassin’s Creed is doomed from the start by the way it conveys this complicated premise, muddling virtually every character’s true motivations until late in the film. The scene-to-scene development only complicates matters, introducing characters with abandon and featuring the likes of Charlotte Rampling, Michael K. Williams, and Brendan Gleeson to deliver a few lines of cryptic dialogue and then retreat back into the shadows, leaving Callum and the viewer none the wiser. While this arcane approach would work to a certain extent in a movie more aligned with the almost reverential tone that is developed in the 1492 scenes, a feeling of sterility dominates, and as such the themes of heritage and dedication that Kurzel attempts to conjure feel fully hollow. As might be expected, Assassin’s Creed‘s strongest moments are the Animus centerpieces. The cuts between Aguilar in the past and Callum playing out his actions in the present quickly grow stale, but Kurzel takes a sort of glee in rendering violence as a series of awe-inspiring moments, enhanced by Arkapaw’s lucid cinematography. From the extended parkour sequences to more silly moments that stick out of the relentlessly serious environment, like Aguilar bouncing an arrow off a stone wall or running on clotheslines, there is some sense of momentum and excitement sorely lacking in the rest of the film. 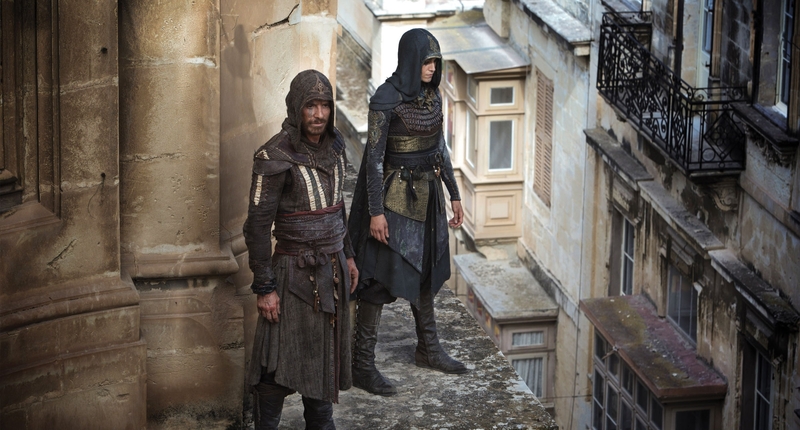 Assassin’s Creed, unfortunately, is the kind of movie that feels perfunctory. The actors, talented as they are, feel stranded in thankless and uninvolving roles, especially Fassbender, whose most memorable action is singing Patsy Cline’s “Crazy”. By the film’s emotionless and drawn out climax where the action finally bleeds into the “real world”, Callum’s embrace of the assassins feels empty, not because it is at odds with his character, but because he has very little character to speak of. And so it is with the film that revolves on him; there is a veneer of interest, but nothing more.